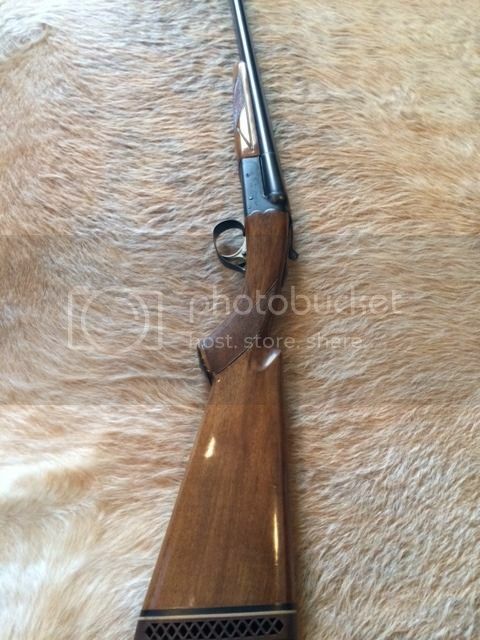 REDUCED TO $725.00 SHIPPED......Very, Very Nice Model 100, Ithica/SKB, 20GA, 24" Barrel, 3" Chamber, I'd rate it at 96-98% condition, it appears to have been a longer barrel gun, cut to 24", barrels are cylinder bore diameter, fully functional, very tight action,no cracks in wood, Zero Rust, a few very light and small marks in glossy wood, one small spot where Bluing rubbed off barrel. 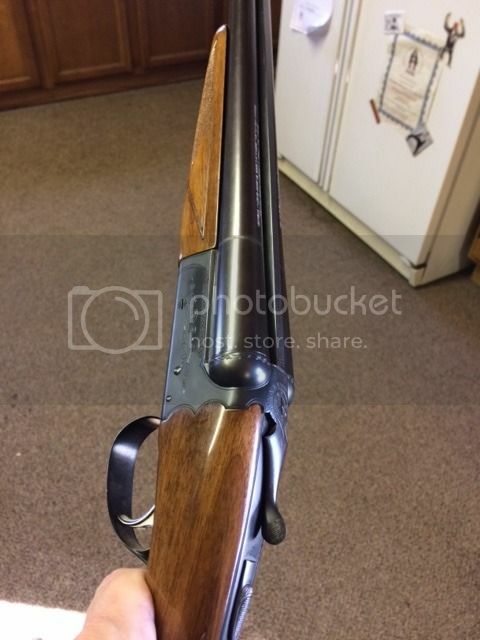 This has not been used as a cowboy shotgun. Cashiers Check or Postal Money Order only Please. Have the barrels but cut down? If not, what is it chocked? correction to the answer of your question. Barrels apparently have been cut. Measured the bore Diameter and the measure out to be Cyl bore. Has any action work been done?.........are the internals stock? I'm surprised this SG has not been sold. It's a great deal! 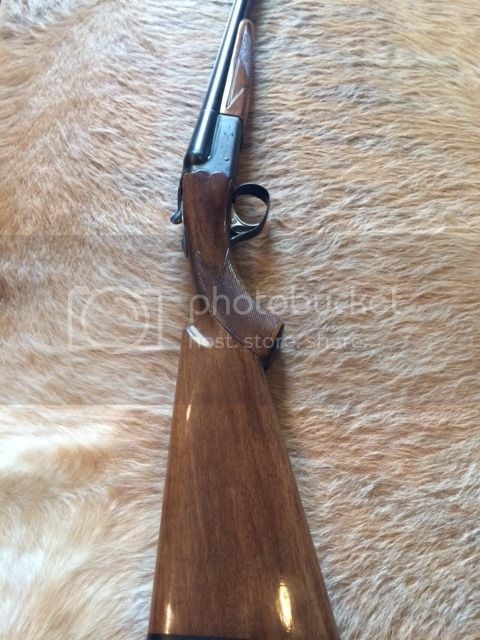 This gun will out last 10 Stoegers. I'm telling y'all it's a stunner in person. Just about perfect! As far as I can surmise the model 100 Ithaca/SKB's in 20ga had factory 25" barrels choked IC&MOD, 28" choked MOD&FULL & 30" choked MOD&FULL, in 12ga the same except 26" choked IC&MOD. I never hear of factory 24" barrels. I bet you have 24" cylinder bore & cylinder bore, even tho very good price. This is what it is. But I'm not going to even pretend to be an expert on these guns. I have edited the response to a previous post, as not to be certain of factory length. I'll betcha the barrels have been cut to 24" & whoever you bought it from lied to you about nothing having been done to the gun. If so, chokes will be cylinder & cylinder. Measure the muzzles & see what they are. Just measured the Diameter. .617"-618" that puts it at standard 20ga cylinder bore Diameter. BUT at the same time, I have bought some strange combinations of SKB,s over the years. I contacted a number of folks and even the SKB folks. and found them to be custom ordered, as well as I could verify. 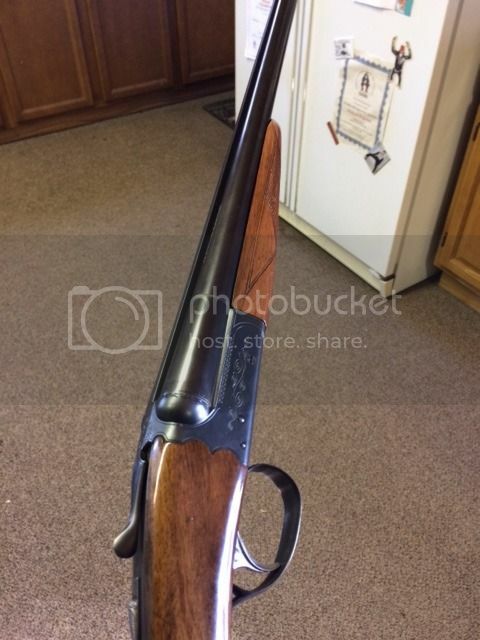 So, that being said...It is a great hunting gun regardless, potential cowboy gun and at a good price. This would be a wonderful Christmas gift for someone. Interests:NRA LIFE SASS LIFE RO II Trying to do whats right in Gods eyes, My family, Old Cars, Guitars, Guns, Airplanes, Trout Fishing. And shooting anything that goes BOOM! If you'll take $700, I'll take it! I would be tempted to switch to 20 gauge at this price. Can't believe this gun is still available. I've paid $1,300 to $1,400 for all three of mine! has the SKB 20ga been sold?